I've managed to get two old projects out of mothballs recently. 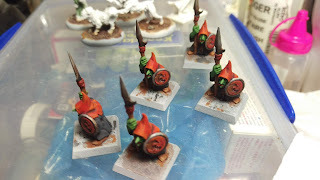 These are the latest 5 Night Goblins brought up to the basing stage. They'll wait for another 5 to be finished, and then a few special additions, to all be based at once. You'll notice that the 5 Night Goblins here are all the same sculpt - this was a conscious decision, and I'll touch on that in a future blog. This is a quick post, but a fun one. After sitting down for painting night and not being able to paint the goblins I was working on, I tried an idea I've had in mind for a while. The model above is about an hour of work. Glued onto two mdf bases, I sprayed it black and painted the model bronze. After some washes, dry brushing, and attempted verdigris, I painted the stone plinth, added some static grass, and called it done.